This video for World of Tanks 8.6 is like a gritty reboot for the extensive trailer series. The tanks are more aggressive; the explosions are more fearsome; the flashes are more flashy; and the music is that much more dubstep-y. It's a boisterous showing for the update, which brings new artillery and an overhauled economy. Given the choice between giant explosions and detailed number-crunching, you'd probably do the same. On top of the general upgrades, retooled SPGs, enhanced tech-trees and (obligatory) new tanks, 8.6 also brings a new map: Sacred Valley. 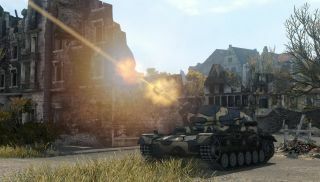 According to Wargaming: "This new Asian autumn map offers a good balance in terms of terrain shape: there are open areas in which you need to be careful not to be shot by the enemy artillery, as well as hills, narrow passages and other terrain providing cover and ambush opportunities." You can find further details on 8.6 at the World of Tanks update page .